It was our very first wedding of the year in 2013 where I traveled farthest away from home till date to photograph this wedding of Justyn & Lisa at Adelaide. 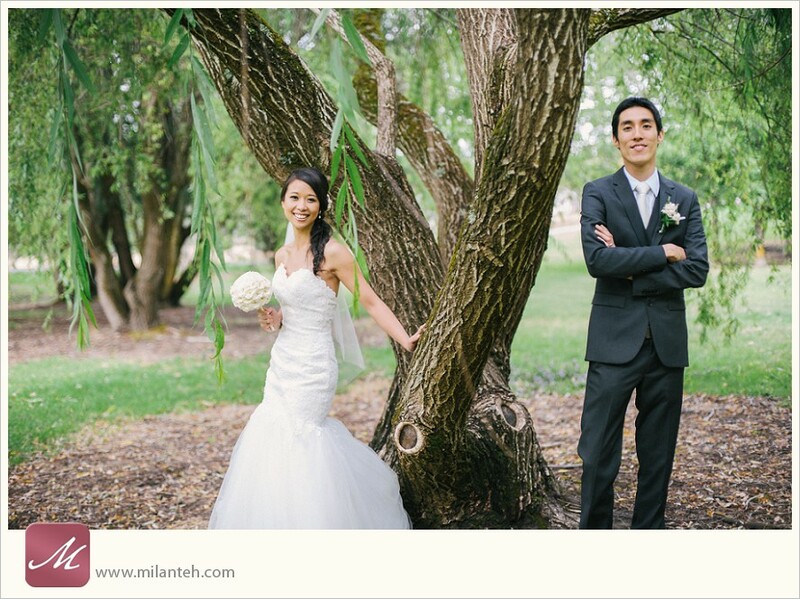 They had a Chinese customary in the morning followed by garden wedding at Mount Lofty botanic garden and then to the reception, side by side. Having the privilege to photograph everything beautiful, it comes with a huge responsibility and pressure too as I work on most part of the sameday slideshow in a moving car when traveling because the itinerary of the day was all too packed with shoots and happenings since morning. I hold my breath of 'kancheong-ness'(nervousness, a Cantonese language derivative) throughout the day till the sameday slideshow is done playing on the reception with a gigantic sigh of relief. The pressure, was humongous. Recalling the experience, it's all fulfilling and delighting. I've never moved around so much and had no sweat at all due to the dry weather, it's rather unique to me but except when it rains that is, during the morning when they have the door games. My camera and strap dried off pretty quickly to my surprise. Learnt a handful of stuff through this wedding and this is the exact copy of photo montage presented on the reception the very same day. Last but not least, I'm very grateful that Lisa & Justyn had so much faith in me to shoot their wedding, it's indeed an awesome kick start to our 2013 with the most number of people coming to congratulate me later in the reception! &.b.t.w. - Read a book and the author suggests that if you make a new year resolution each year, it's just a meaningless short term goal. To make it more meaningful, you might want to try set a/some goal(s) 5 years from now, write it down, hide it somewhere you might not randomly bumped into. When the time comes, find that paper and see what you have accomplished and not to forget to laugh at yourself as most might find they aimed too low. &.&.b.t.w. - I am very lucky that I need not experience the 44'C temperature they had in summer before while I was there in Australia during summer! I was welcomed by a nice cooling 19-22'C atmosphere. &.&.&.b.t.w. - Upgraded internet speed at home lately. How things have changed... Do you still remember how the annoying dial-up modem sounded and you needed to wait maybe half an hour just to download one darn song? It takes seconds now and even 4G connectivity is soon to be available in Malaysia.